Are you looking for the best things to do in Singapore?. We did a Singapore 3 day itinerary in this truly epic place. You will probably of heard of the Singapore universal studios which is on everyone’s Singapore itinerary as this is one of the most popular things to see in Singapore. But there is plenty of other things to check out. The Universal studios is on Sentosa island, which is accessible by the Singapore monorail or road. The Sentosa islsand is one of my best things to do in Singapore. 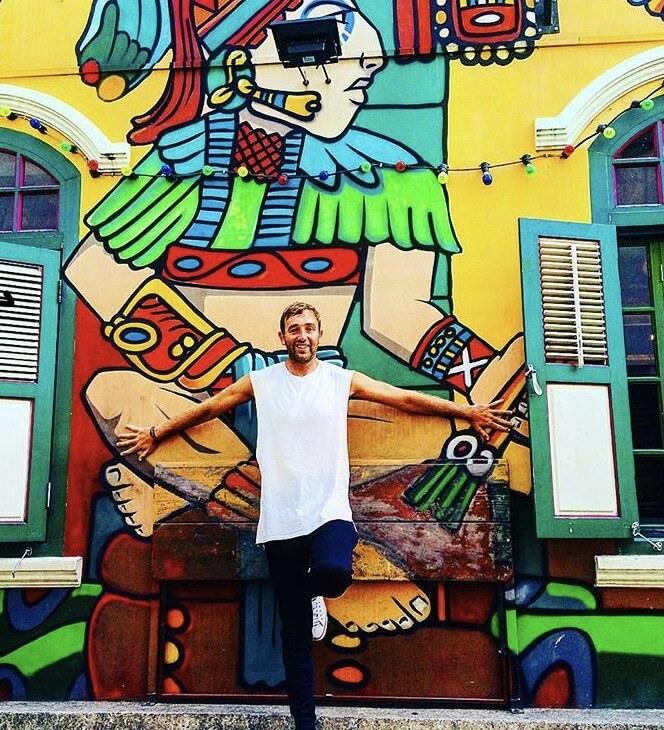 What do in Singapore in 3 days? 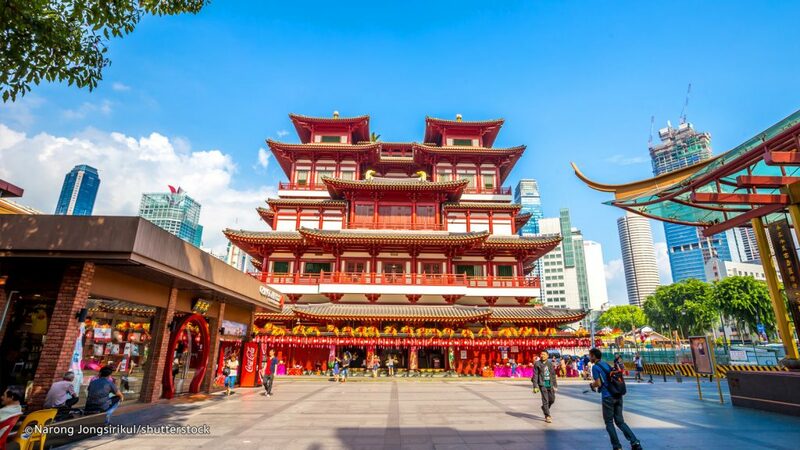 I knew Singapore was going to be an expensive few days, but we tried to keep the cost down as much as possible and tried to keep it a budget itinerary for Singapore. We experienced the best things to do in Singapore. The ultimate Singapore 3 day itinerary for the best things to do in Singapore and where to stay. 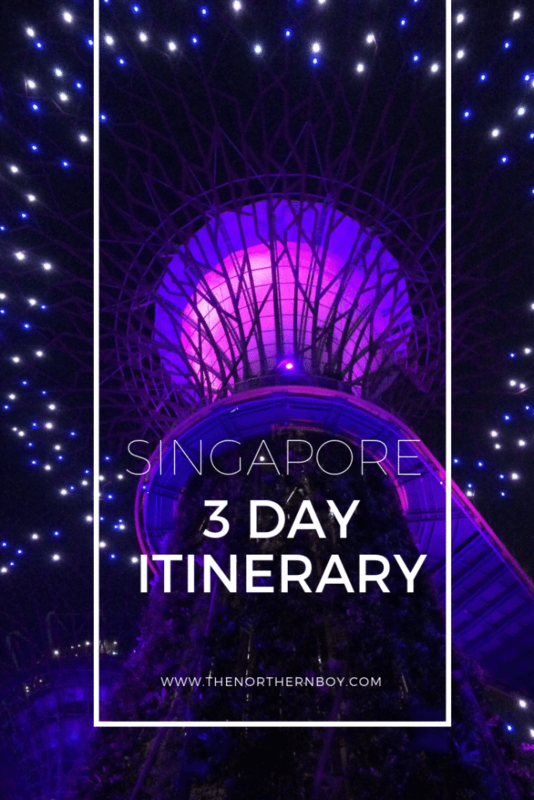 Let’s get to a fun packed 3 days on the Singapore 3 day itinerary! How many days or how long to spend in Singapore? You will have more of an understanding with this guide to what to do in Singapore in 3 days. Also, I trekked in the hot sun on average 9 miles a day for the 3 days in Singapore, so it’s fair to say I did manage to cover the best things to do in Singapore on my visit. 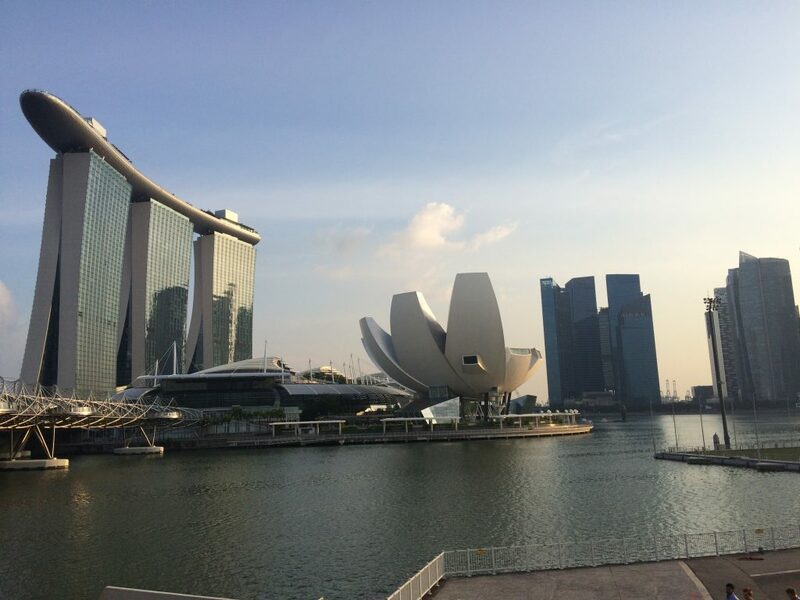 On your visit you will get see things such as Gardens by the bay, Sentos island and Marina Bay hotel. The Marina Bay hotel is the definitely the best accommodation in Singapore if you are on a luxury visit. MRT – The best, fast and cheapest way to get around Singapore is via the underground MRT system. A great tube system that allows you to travel around Singaporean ease. It is very similar to the London Underground tube system if you have ever used that? How to get a ticket to the Singapore MRT station? When you arrive at Singapore Airport, you will have the option to rent an MRT card for $5. Then, you top it up as you please. But don’t worry the journeys are cheap. You won’t pay much more than a dollar for any of your journeys on the Singapore underground trains.In total I only spent $15 on the MRT system, in 3 days in Singapore. This also included the train back to the Singapore airport. Also, any money left on the card can be claimed back at the airport. Taxi – If you want to get somewhere in a hurry, the you need to flag a cab. Taxis are fairly priced: The meter starts between $2 to $6 and then (about $0.16) per kilometer thereafter. Most drivers will speak English, so be sure to chat with them for local tips on your Singapore itinerary. Bus – Buses travel all over the entire country and can take you everywhere you need to go. The numerous bus routes may overwhelm or confuse first-time visitors. The price depends on how far you want to travel, time of day as well as traveler type (adult, children and senior citizen fares are offered). Based on all those factors, you could end up spending the same amount that you would for a metro ride. On Foot – Obviously Singapore is a massive city. So being on foot is quite tricky to see all the best things to do in Singapore if you’re on a tight schedule. But remember you will need to do some walking to take on all the amazing sights on your Singapore itinerary. What to see in Singapore in 3 days? The visit to Singapore was a big culture shock after visiting Thailand. Whatever type of visit you are on to Singapore, you will be completely astounded at its culture and architecture. I said “it’s a cross between London and New York”. You will get see this stunning place on the Singapore itinerary which you could stretch out into a Singapore 4 days 3 nights itinerary. One of the best places to visit in Singapore in 3 days. 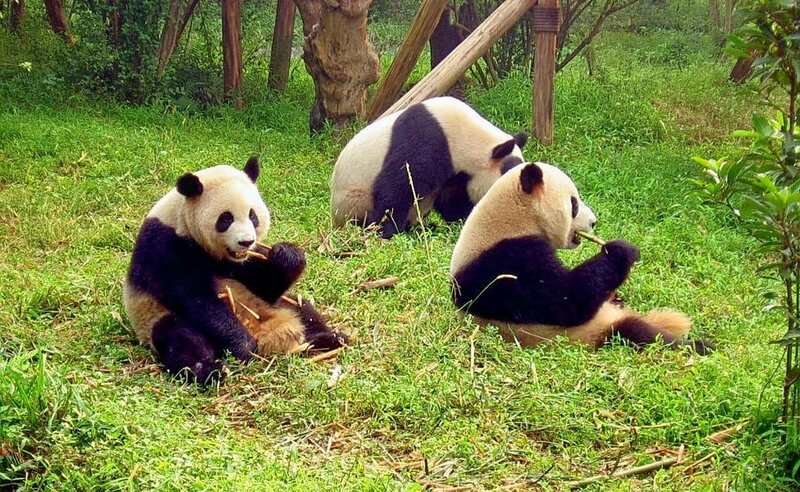 It’s Located on a peninsula in the Upper Seletar Reservoir, the Singapore Zoo is spread over 28 hectares and is renowned as one of the best zoos in the world. The zoo has a variety of animals that are the kings of their natural habitat like enclosures. There are animals from all species throughout the world in here, ranging from raccoons, baboons, Nubian Ibexes, polar bears, white tiger, giraffes, zebras, cheetahs, and the list is never-ending. However, the highlight of the zoo in Singapore is when the orangutans are fed by tourists daily from 11.30 am and 3.30 pm. The zoo also has a separate Rainforest Kidzworld for children. Therefore, this is a top place to visit for families looking for things to in Singapore for kids. The Singapore zoo is regarded as a role-model zoo by several other Asian countries. This is one of the best things to do in Singapore in 3 days. 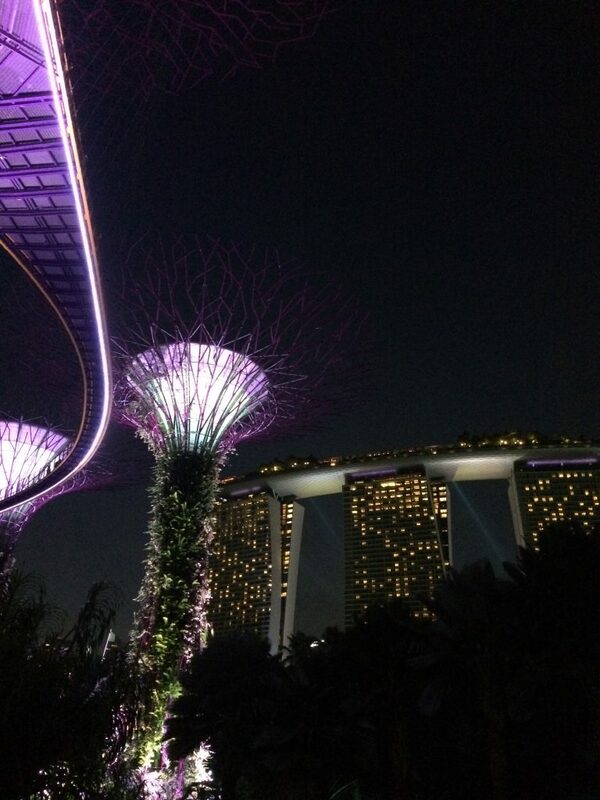 This very cool experience, exploring Singapore’s gardens by the bay. We had seen the photos on Instagram of high standing tree light show at night and had to discover it for ourselves. This is probably one of the first things in your bucket list for Singapore. Because, it surely was on our itinerary. A good option is to get to the Gardens by the bay at 5:30pm and buy a multi entrance ticket. Then, the ticket includes entrance to the flower dome, cloud mountain and the sky-walk to watch the show. 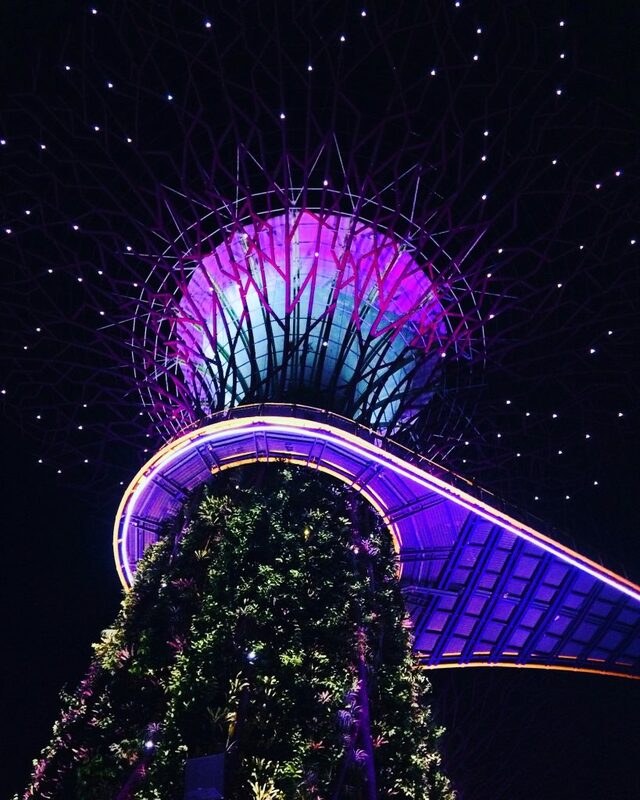 The gardens by the bay light show is one of the best things to do in Singapore. A 15 minute show of music and light spectacles. Your ticket allows you to watch the show from the top of the trees, however there is a big queue and we didn’t manage to get up there till after the show. The show is on two times a night 7:45pm and 8:45pm. Get there at least 25 minutes before the start of the show if you want to get up to the bridge. Although, we did really enjoy watching it from down below. The amazing light show is one of the best places to visit in Singapore in 3 days. 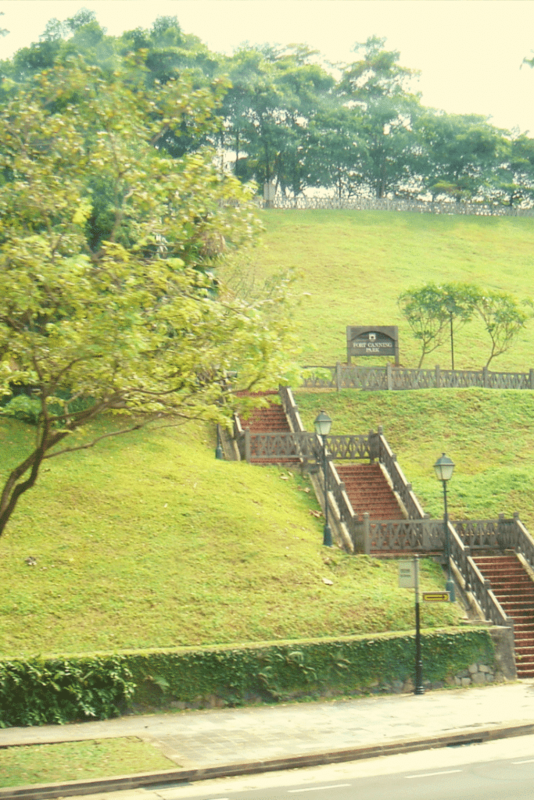 You can do an epic sightseeing walk of the Colonial District in Killiney Road, this is a cool hike around Singapore. Also, You will have the shade from the large city trees for your hike. Top Top – Wear some trainers or comfortable shoes for walking around Singapore. Because, you will be covering some mileage and you want to be comfortable. The weather in Singapore can be very hot and sticky. Singapore’s best activities for kids. 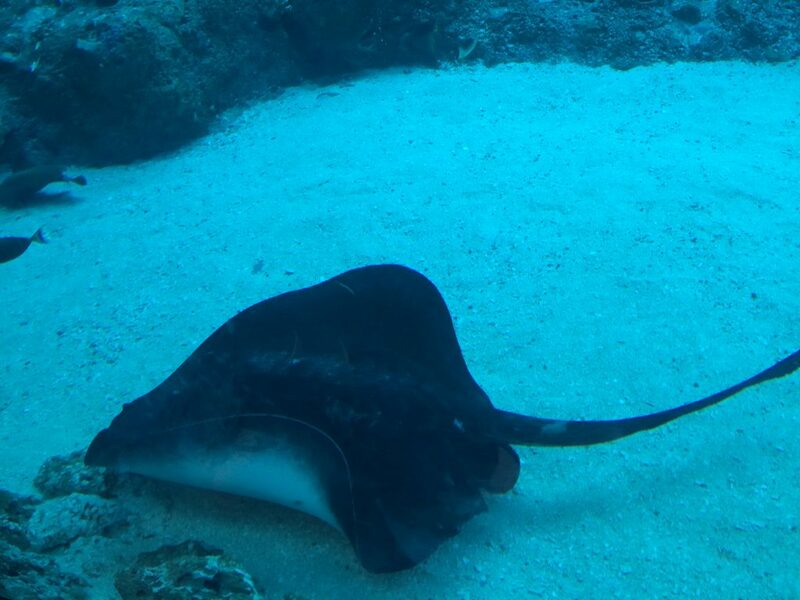 The Sentosa island is an epic tourist spot of things to do in Singapore for everyone, including those of you looking what to do for children in Singapore. Sentosa is one of the most popular places to visit in Singapore. So what’s on this epic Sentosa island? Singapore’s universal studios, S.E.A Aquarium, Beaches, Bungee Jump, Restaurants, Museum, Jungle trek. This island is definitely up there as one of the best places to see in Singapore. How to get around Sentosa island? Sentosa island is quite big to get around. But don’t worry there is a cable car and a free bus transportation around the park. It really is a mega place to visit, you can even walk around it without spending any money. That’s why it’s on my Singapore itinerary for you! How to get to the Sentosa land? – you can either get a taxi from Singapore centre to the island. However, the best and cheapest way is the Sentosa island monorail. The monorail ticket to Sentosa island – (€4) and drops you off at 3 different stations on Sentosa. The $4 fee also includes return. This is by far the best Aquarium I have ever seen, it’s no wonder it’s ranked as the 3rd best aquarium in the world. The Singapore S.E.A aquarium is home to over 100,000 marine animals of over 1,000 species. An unforgettable experience on my Singapore itinerary. I couldn’t believe the size of various marine tanks. The shark area is out of this world. Being so close to these notorious beasts, is a surreal moment. . Fun fact – The hammerhead shark is an internal sensor it’s hammer shaped head, which allows it to detect prey buried on the seabed. It’s like they have their very own built-in GPS system. 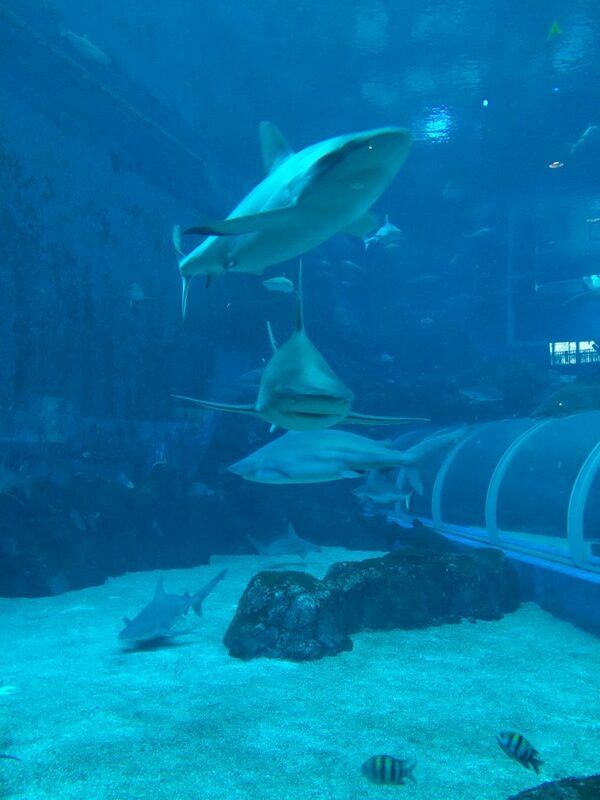 You can enhance you shark experience and walk through the epic underwater shark tunnel in the Singapore aquarium. 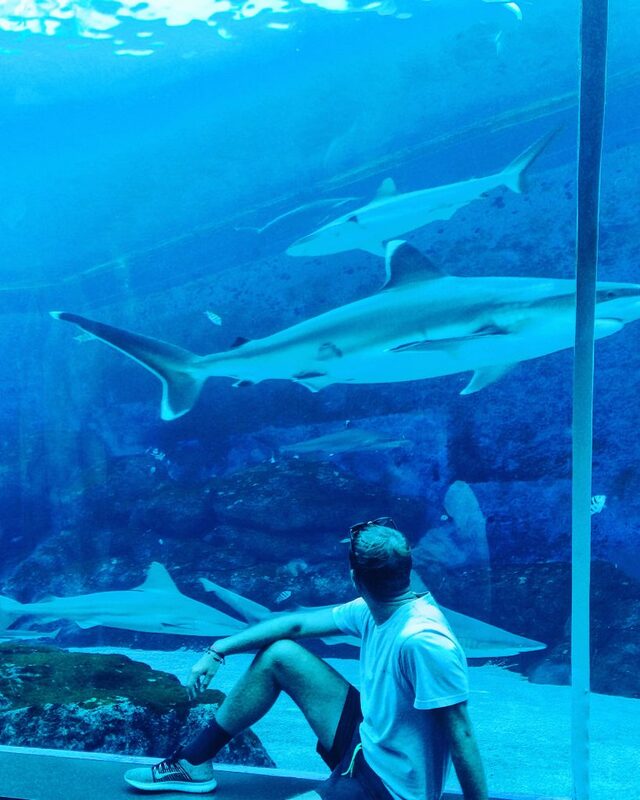 How cool is that, it’s the closest you can get to the sharks without actually being in the water. You can grab a great Instagram photo here. 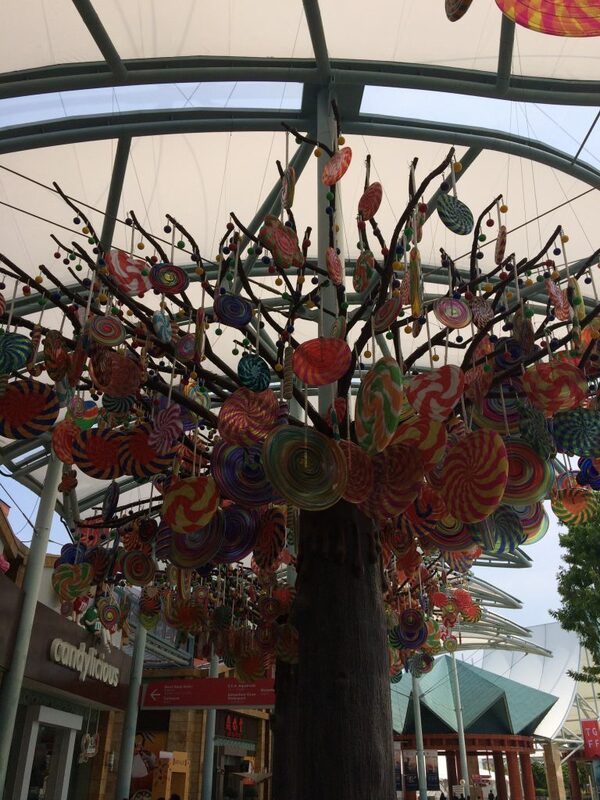 If your doing a Singapore itinerary with kids then this is where you should bring them. So much fun for the kids and adults. 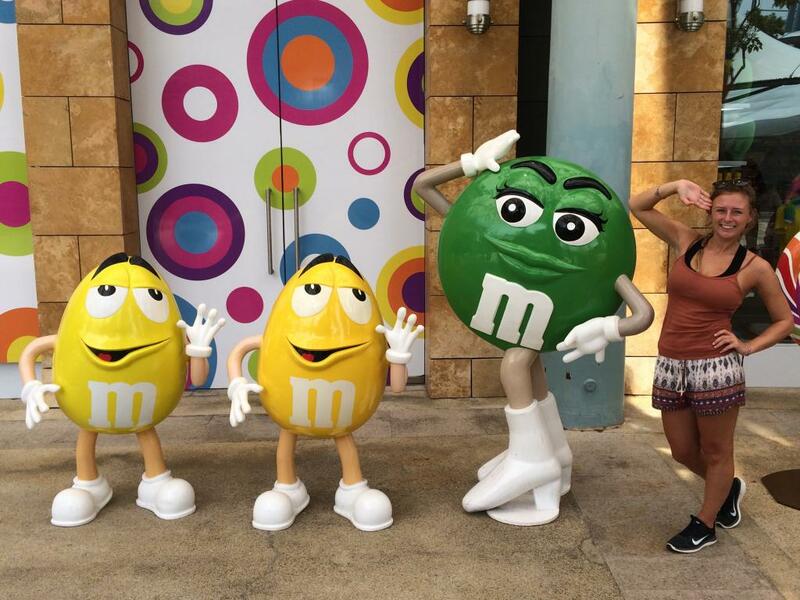 The Universal studios in Singapore is one of the coolest things for families on the Singapore itinerary for 3 days. The rides at this top theme park in Singapore will blow your mind. 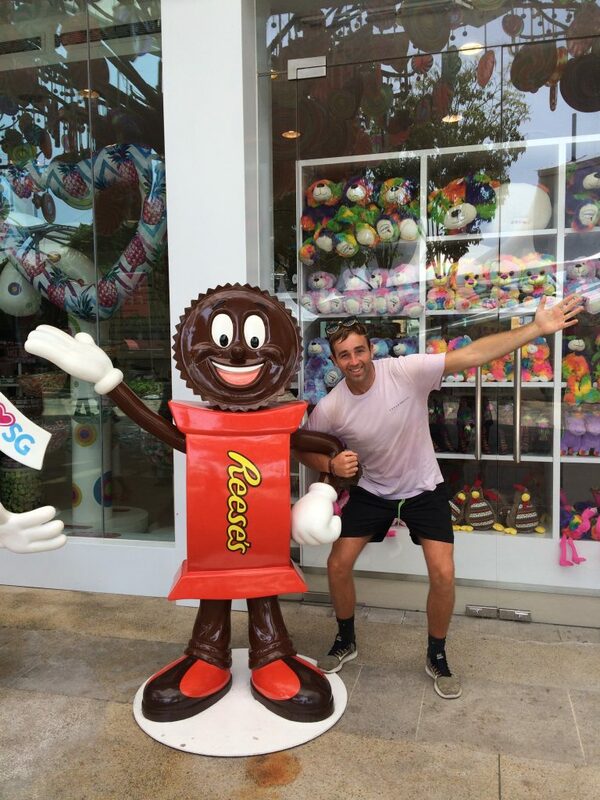 Also, if you are looking for something to do with kids in Singapore, then you shoud definitely check out the Universal Studios in Singapore. Step into a world filled with characters and sets from animated flicks and high-octane hits as you arrive in Universal Studios Singapore. Get greeted like fairy-tale royalty by Shrek and Princess Fiona in the land Far Far Away, scale the walls of The Lost World to explore precious stones and fossilised insects, and join your favourite Madagascar characters on board a wet-and-wild boat ride. In Sci-Fi City, experience intergalactic battles, then stroll through streets flanked by brownstones and bodegas in New York. Check out the stars Hollywood’s Walk of Fame and look for mummies in Ancient Egypt. With 7 different themed areas to explore and 24 different rides to hop on, Universal Studios Singapore offers a slice of the silver screen that everyone can enjoy. This is Southeast Asia’s first and only Universal Studios theme park, featuring 24 rides, shows and attractions in seven themed zones. This is a true top things to do in Singapore. Singapore’s aquarium. The 3rd best aquarium in the world. 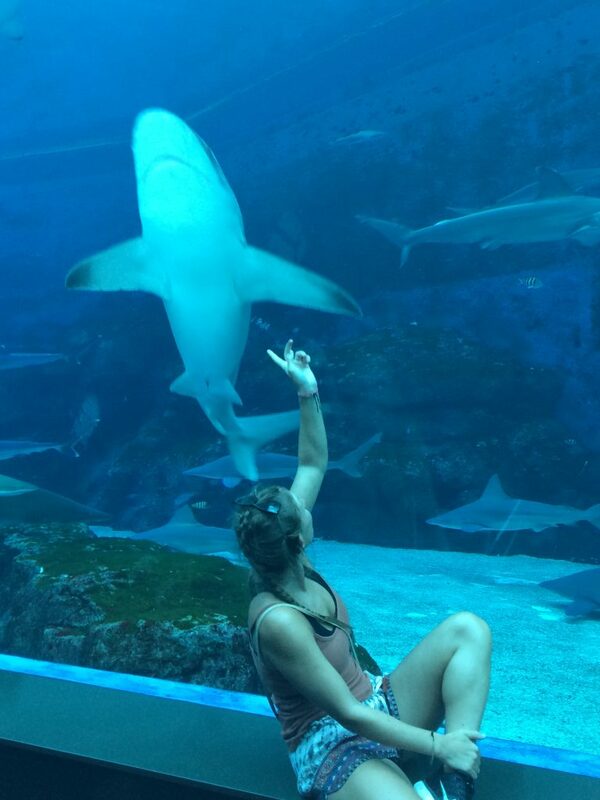 Singapore’s sharks at the 3rd best aquarium in the world. The Night safari is one of the coolest things to do in Singapore. You will get to see the animals really come alive. However, if you want to see the animals through the day. You should go and check out the Singapore zoo and night safari. The Night Safari in Singapore will take you on open-sided shuttle trams that drive you on a guided tour of the park where you get to see awesome animals like tigers and leopards. At the night safari, you can also walk specific trails of the park. There is also the Creatures of the Night show; an interactive 20-minutes show. If you are looking for something to do with kids in Singapore, this is it. The creatures of night show is at 19:30, 20:30, and 21:30 + 22:30 on Fridays and Saturdays. What is the price of the night safari? Opening hours of the Night safari: from 19:30hrs to 24:00hrs. 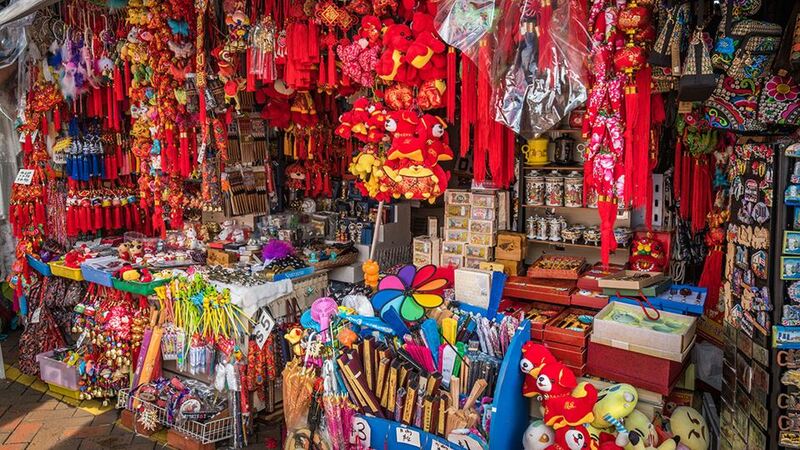 Take a cultured walk through Singapore’s China town. China Town clashes with the typical infrastructure of Singapore, with its low buildings. Traditional Chinese cuisine smells and bold red/gold colours swarming through the streets. The moment I stepped onto Singapore’s China town, I could instantly feel of the Chinese heritage. It’s fair to say Singapore’s China town sells everything. I picked up a new watch for $3 and to this day it’s still working, fingers crossed. Furthermore, there is also plenty of places to eat in China town. The food is tasty, however the prices can be expensive. I had some of Singapore’s Chinatown chicken and rice, it cost me $9. Could get 5 meals for that in Thailand. 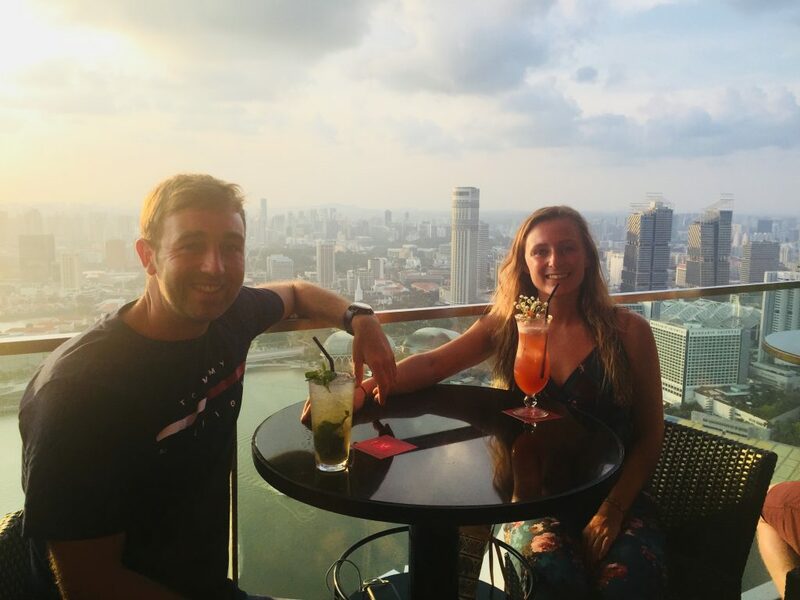 This was an amazing experience of sipping a cocktail at the famous Marina Bay Sands hotel, whilst enjoying the overlooking view of Marina Bay, Singapore skyscrapers, the Singapore flyer and everything else in the distance. The view from Singapore’s most luxurious hotel is jaw-dropping, you can see for miles and miles. For the best view you should visit tower 3 of the 3 tower on the Marina Bay Sands hotel. This one provides the best views of Singapore. What is the Marina bay hotel cost? 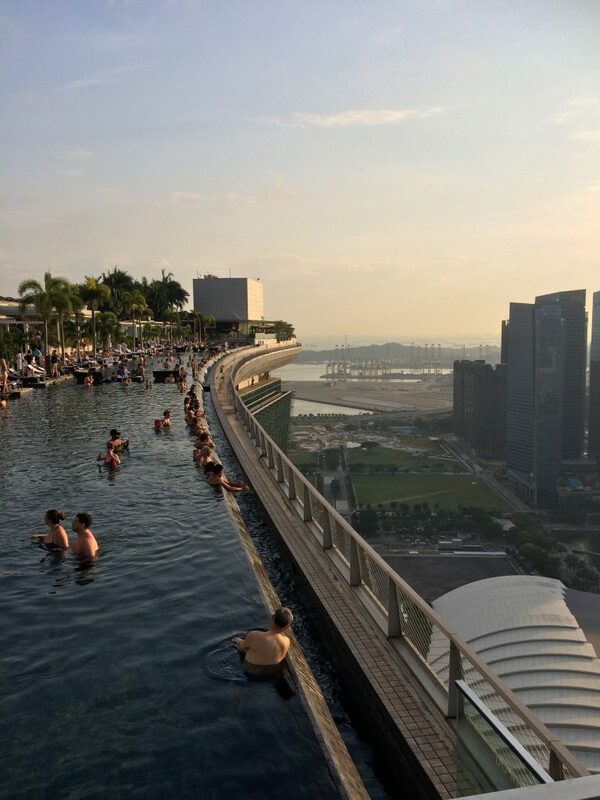 There is a $20 admission fee to the bar at the top of the Marina Bay hotel, however, you can spend this on drinks so it won’t cost you a single dime to see the best views in Singapore. 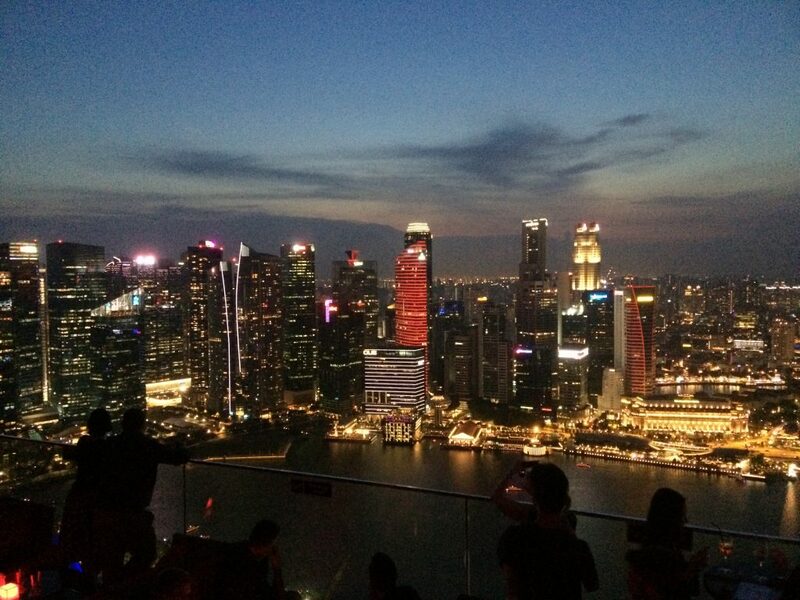 When is the best time to visit the Marina Bay Sands Hotel skydeck? You should try to reach the bar at the top just before sunset. You will see an extraordinary sunset behind Singapore’s structural buildings and then you will get to see the stunning nightlife. 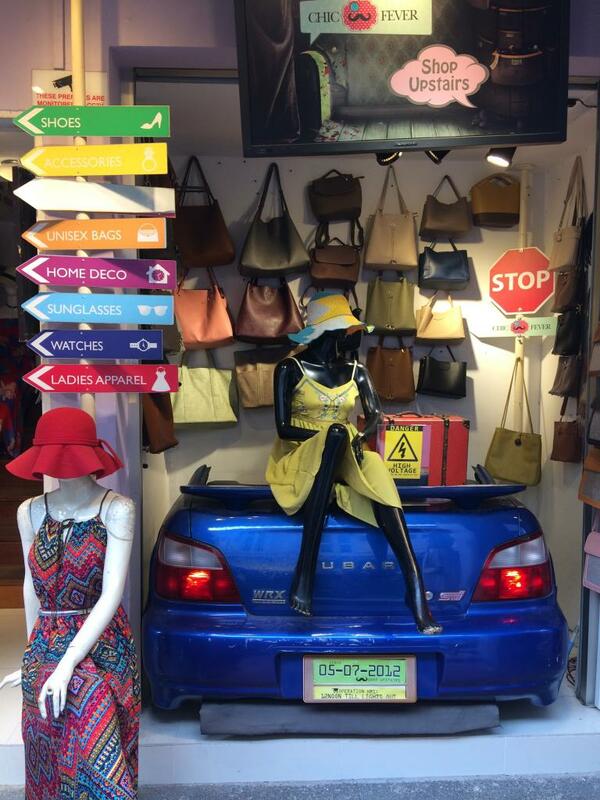 Shopping in Singapore? This overwhelming 24 hour shopping mall in Singapore is a place you need to visit for some goodies when staying in the amazing Singapore. Originally opened in 1971 as a small-clothes store. Now this gigantic superstore offers everything from sweets to electrical goods. Also, each large floor is dedicated to a category. I.e level 2 is for food, I think there is 5 floors in Singapore’s Mustafa shopping centre. Meat and fish – I saw every meat and fish that I have ever tasted and more. The seems to be at least 50 brands of each type of meat and fish as well. Suppose you can never have too much. Electrical items – by this I mean everything you can think of. Hand fans, shavers, phone accessories, children’s toys and plenty more. 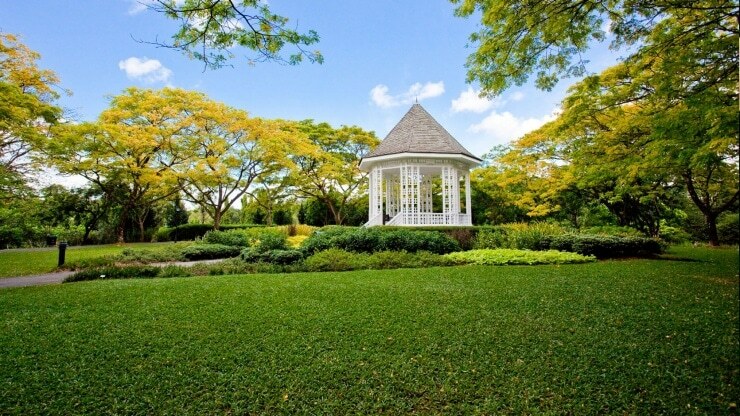 Get away from Singapore’s city streets and head for the lung cleansing Singapore Botanic gardens. A stunning landscape of greenery, lakes and a a vibrant atmosphere. The Singapore Botanic gardens are now a UNESCO world heritage site. It is actually the first Botanic Gardens in Asia to be named a world heritage site. In addition, there are a cool 47 heritage trees in Singapore’s Botanic Gardens. This is the perfect place to spend a few hours of walking and then relaxing in the sun with a picnic. At weekend the Botanic gardens gets slightly busy with children’s clubs playing group activities and games. 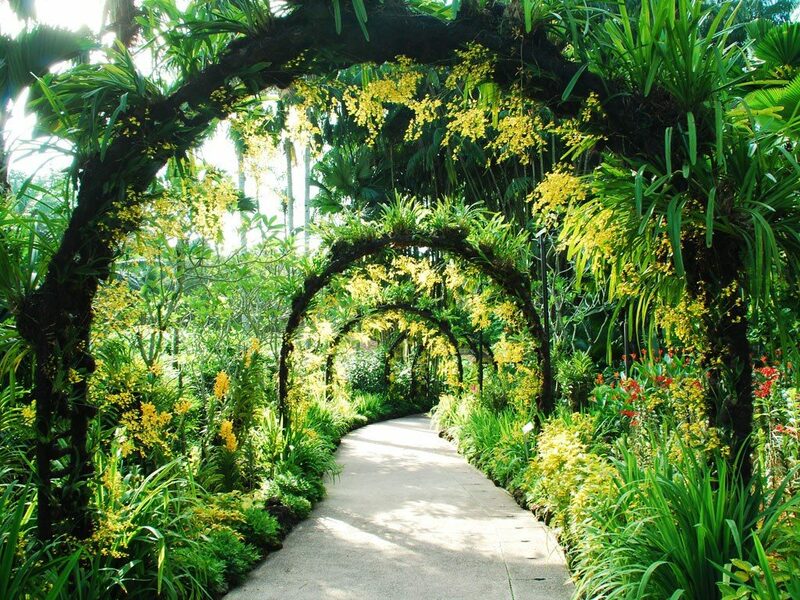 How to get to the Singapore botanic gardens? There is a Met stop right outside the Botanic gardens (Botanic gardens MRT station), so this is the best way to get here. The best market in Singapore. A buzzing market filled with stalls, locals and tourists. We accidentally came across this, but soon realised it’s probably one of the best markets in Singapore. You will find endless amounts of Singapore goods for cheap prices. There’s rows and rows of great stalls for you to enjoy rummaging through. However, my bartering skills didn’t work as well as they did in Thailand and other Southeast Asian countries. Nevertheless, you can still pick up a great bargain. Singapore’s Bugis market also has plenty of hot food, sweets and drinks on offer. We had dinner there and it was only $4 for chicken teriyaki and rice. The Bugis market in Singapore also has an outdoor area that sells plenty of more goods. You will find locals wearing microphones trying to sell household items and other random goods. This top market in Singapore seemed to be very busy, so head there in the morning if you’re not a big fan of the hustle and bustle. Discover a jaw dropping Panoramic view on Asia’s largest observation wheel. You can sit back and let Singapore’s flyer take you to the sky and deliver some of the finest views of Singapore you will get to see on our visit. You will spend 30-minutes teaching a peak of 165-metres above sea level. With a 360-degree view of Singapore. Each cabin is filled with roughly 8 person, we was lucky to just have 6 of us in the cabin. It was like a personal flight to the Singapore skyline. The views are amazing, you can see the business skyscrapers, the Bay Marine Sands hotel, the sea and plenty of other cool best things to see in Singapore. If you are on a Singapore 2 or 3 day itinerary with kids then you should take them on this top activity in Singapore. The kids will love the amazing views, just like we did. Top Tip – he bought our Singapore flyer tickets at 6:30pm and made our way onto the ride at 6:45pm. This way you get daylight views, sunset and the nighttime views. Singapore nightlife definitely provides the best views. It’s a surreal setting. Our hotel in Singapore was in little India, so this is the first place on the Singapore itinerary that we explored. Little India is exactly what you would expect on a visit to a busy India. The streets are loud, there’s Indian cuisine being sold on every street and there is plenty of markets stalls. The vibrant Indian culture stands out from the rest of Singapore, like a sore thumb. We decided to make our way for some lunch at little India’s Hawka. A hall filled with little stalls selling Indian food, such as chicken curry. If you fancy trying the local Indian food in Singapore, then you should definitely visit here. 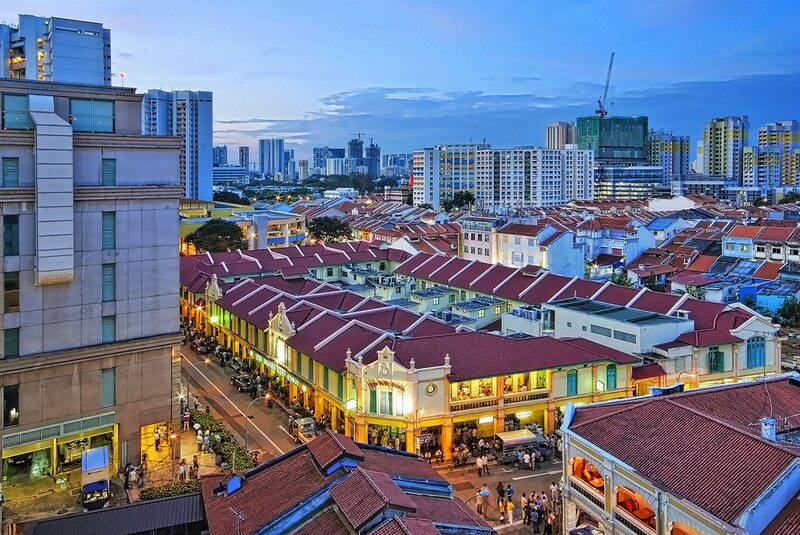 For our Singapore 4 days 3 nights stay, little India was our chosen place to stay. Top tip for your Singapore itinerary 3 days – you will only an hour or two here max. 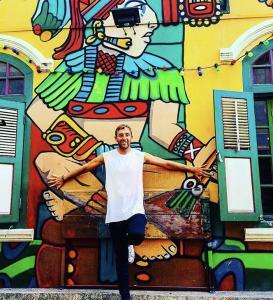 I wouldn’t plan many hours on visiting Singapore’s Little India. 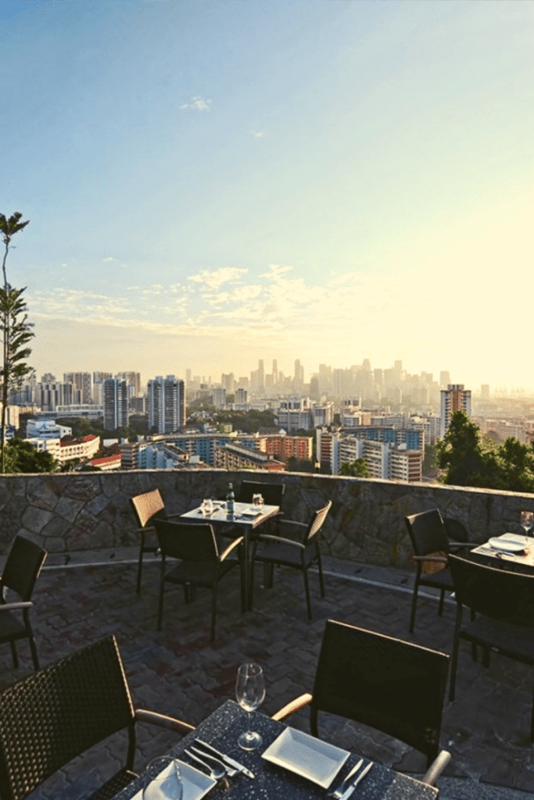 For $20 SGD ($15 USD) you can go up Mount Faber with a combo-ticket on the same day. 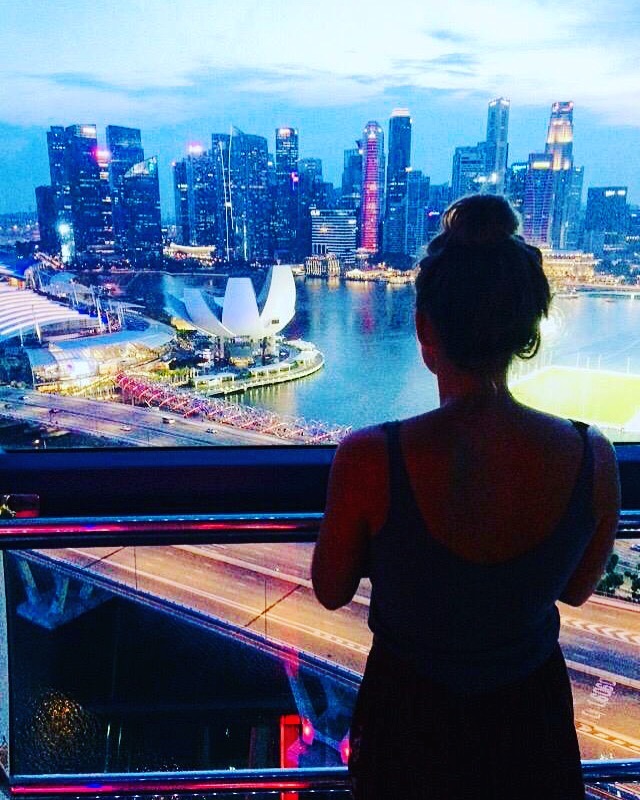 Views from this sweet Singapore viewpoint are amazing. Remember to take your camera up to the top of Singapore’s Mount Faber, you will great some great photos. Also, you can expect to climb over 105 metres to the peak of Mount Faber. Where is Mount Faber? This epic hike in Singapore is located in the town of Bukit Merah. While discovering the best things to do in Singapore, you should check out Tampines Regional Library. Even if you are not the biggest fan of reading, it’s still worth visiting. The library has more than 40,000 books. Even cooler in a 700-metre running track and a hardware lab. Not your average library. To get to the Tampines library, take the East West Line (MRT) or a taxi, but it will take you 45 minutes to get to Tampines from Downtown Singapore. When does the Singapore library open? The Library is open for visitors every day from 10 am to 9 pm. Want to get your adrenaline buzzing? Check out the Singapore IFly. The activity will cost you $89 SGD ($66 USD) for a beginners walk-in rate,. This is one of the most active things to check out if you’re looking for things to do in 3 days in Singapore. You can also try and check out the Singapore Grand Prix. We missed this but I would love to go back and watch this top thing to do in Singapore. The amazing Marina bay sands hotel in Singapore is a must when visiting Singapore even if only for one night. The infinity pool on the 57th which can only be accessed by guests, the Marina Bay Sands hotel is one of the most iconic things to see in Singapore. Access to the Gardens By The Bay, the shopping mall and the Art/Science Museum is really easy from this epic Singapore hotel. Service is excellent, cheerful staff are happy to help with anything you need. Overall the Marina Bay Sands hotel in Singapore is the best you will get, but the most expensive. The Fullerton is known as one of Singapore’s most luxurious hotel. This old-school five-star colonial style luxury hotel delivers amazing world-class service during your stay at this top Singapore hotel. If it is within your budget staying here is an experience in itself. Also, there is a 25m rooftop swimming pool overlooking the Singapore Marina Bay. The views here are epic. Definitely a top place to stay in Singapore. Parkroyal on Pickering is a cool eco-conscious five-star hotel. This is a very unique hotel. You will find daily refilled glass water bottles to pens made of bamboo. The rooms at this top hotel in Singapore are modern, spacious and very comfortable. The view of the Singapore Skyline from the room is really amazing and makes it that extra specail stay. There is an infinity pool as well as a well-equipped gym. Do you enjoy a breakfast buffett? Well you will love the one on offer here. The location is sweet with both the Chinatown MRT Station and the Clarke Quay MRT Station next to the parkroyal on pickering.. The Inn crowd backpackers – This budget hostel accommodation in Singapore was a sweet place to stay. However, it’s obviously more expensive to other countries in Asia. 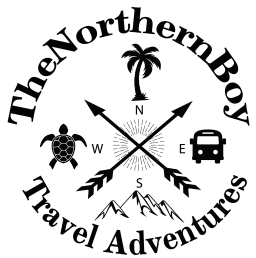 If your on a budget trip 3 day itinerary then you should definitely aim to stay here. This was actually the most cheapest place to stay in Singapore that we could find. It cost $16 a night and we was supposed to stay in a 8 person dormitory. Luckily though, they gave us our own private room of a bunk bed and tv. The room was tiny, but we had a great few nights sleep and seemed to really appreciate this box room. You won’t find tons of places to eat local Singapore food, you will find plenty of western world food. The best place to find the local food is on the markets in Singapore. The food is okay, but it’s not much cheaper than the western food in Singapore. Also, other than the markets, there isn’t lots of places to find the local food. Singapore seems to offer more western food, but it was a nice break from the local food I’ve been just been eating in Thailand for 2 months. Like I mentioned western food can be found all over Singapore. It’s crazy there’s McDonalds, subways, burger kings and more. We were over the moon when we found out there’s a Nando’s! We haven’t seen a Nando’s since leaving England 4 months ago. In addition, the popular places to eat in Singapore are the China town and little India. If you like curry, I would highly recommend going to Singapore’s Little India and trying out some mega tasty local cuisine. There are lots of western restaurants in the shopping malls in Singapore and I did notice food is sold a lot in Singapore’s underground tube stations. Get snacks when you can, some restaurants in Singapore can be expensive. Wear comfortable shoes. You will be doing a lot of walking. We racked up over 9 miles exploring our Singapore itinerary. Hotels in Singapore are expensive if you’re on a backpacking budget. We found are cheapest hotels in Singapore on Booking.com. Get to the Gardens by the bay light show early if you are watching from the towers. The ques get really busy and they only let so many people up. Singapore is an awesome places and there is many epic things to do in Singapore for everybody. How many days to spend in Singapore? 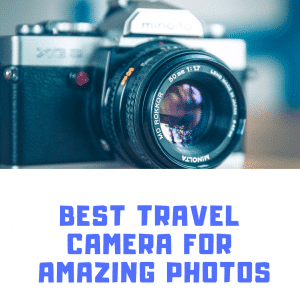 3 or 4 days in Singapore is plenty and you can certainly see all the top tourist spots in that time.You should try and check out the famous Singapore Universal Studios and the Marina Bay Hotel Skydeck. 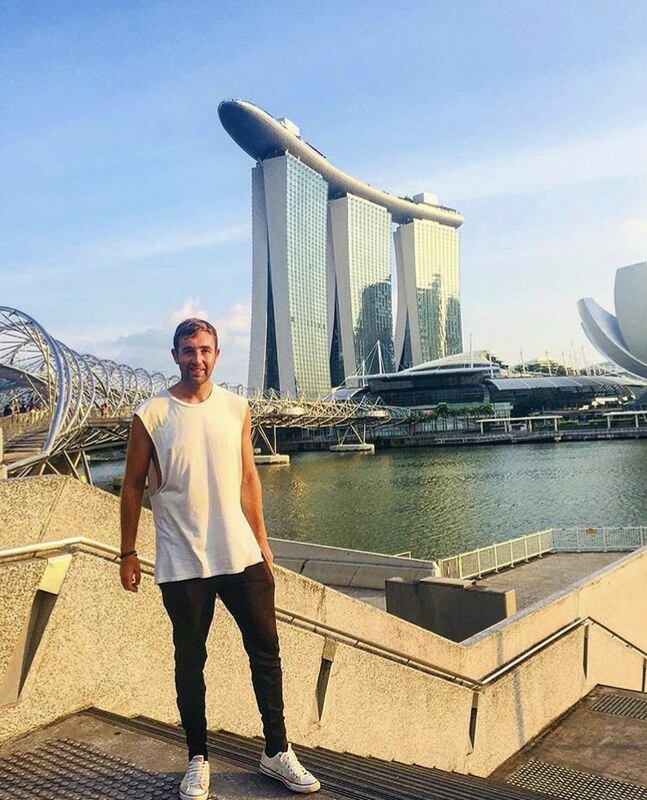 I had an amazing time on my visit to Singapore and it was one of the best places in Southeast Asia that I got to visit whilst backpacking in Asia. I could of happily stayed in Singapore for longer as it is a super-cool place with lots of things to do. You will definitely have enough time with 3 days to see all the amazing things and activities in Singapore.